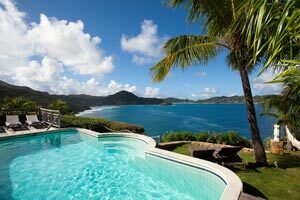 Villa UJV 212, also referred to as Cocoland, is a spectacular 2 bedroom Pointe Milou, St Barts, villa with dramatic sunset views. It's an ideal villa for two couples desiring equal bedrooms and privacy. Well maintained, Villa UJV 212 is comfortably furnished with a wonderful mixture of wicker and pastel fabrics. The al fresco dining area offers spectacular views and seating for eight. The pool terrace has several lounging spaces both open & sunny and shaded & private. Both master bedrooms are a serene retreat with crisp white linens on the elegant 4-poster beds. SPECIAL NOTE: this villa must be rented as a 2 bedroom over Thanksgiving.